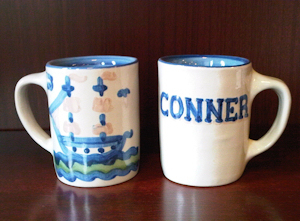 I understand Personalized Pottery takes a MINIMUM of 4 weeks to mold, paint, form, process, and ship. Due to the uniqueness and variations of pottery making, this process may take longer. Hidden Staircase cannot guarantee delivery dates on Personalized Pottery Orders. Your payment will be processed now as the order is submitted for creation. Once begun, no changes/cancellations will be accepted. No returns/exchanges on Personalized Pottery.